Save Time Organizing Parents & Students! 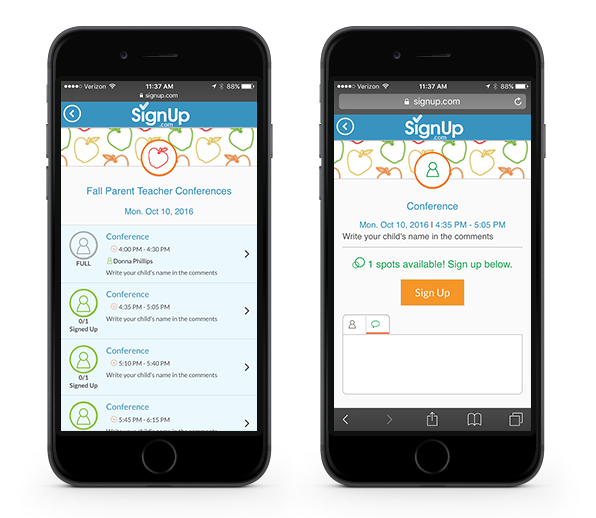 Try the easiest way to schedule parent teacher conferences, presentations, classroom helpers, parties, performances, fundraisers and more! Free, online SignUps and volunteer calendars save teachers time and boost participation.
" Thank you for making it SO easy to schedule parent-teacher conference appointments this year. Within 24 hours, almost all my class parents were signed up, and the automated reminders were great! " " Your program saved me SO much time scheduling class readers and parent teacher conferences. Even better, I had zero no shows! The reminders sent were a huge help and I appreciate it. "